Apple today announced financial results for the first fiscal quarter of 2017, which corresponds to the fourth calendar quarter of 2016. For the quarter, Apple posted revenue of $78.4 billion and net quarterly profit of $17.9 billion, or $3.36 per diluted share, compared to revenue of $75.9 billion and net quarterly profit of $18.4 billion, or $3.28 per diluted share, in the year-ago quarter. Both revenue and earnings per share were company records in what is traditionally Apple's strongest quarter due to the launch of new iPhone models. Gross margin for the quarter was 38.5 percent compared to 40.1 percent in the year-ago quarter, with international sales accounting for 64 percent of revenue. Apple also declared an upcoming dividend payment of $0.57 per share, payable on February 16 to shareholders of record as of February 13. Apple sold a record 78.3 million iPhones during the quarter, up slightly from 74.8 million a year earlier, while Mac sales rose slightly to 5.4 million units from 5.3 million units in the year-ago quarter. iPad sales continued their recent declines, falling to 13.1 million from 16.1 million. Apple's guidance for the second quarter of fiscal 2017 includes expected revenue of $51.5–53.5 billion and gross margin between 38 and 39 percent. Revenue guidance is slightly below analyst expectations. Apple will provide live streaming of its fiscal Q1 2017 financial results conference call at 2:00 PM Pacific, and MacRumors will update this story with coverage of the conference call highlights. 2:57 pm: Conference call has ended. 2:56 pm: Follow-up: People think iPhone has matured and changes are incremental. Do you think you will surprise people with innovation? Cook: Smartphone is still in the early innings. Lots more to do, and every year it becomes more important to people. I talked about home automation, but I could have talked about health, CarPlay, enterprise, etc. And we've got exciting things in the pipeline. 2:55 pm: Q from Steve Milunovich, UBS: iPad looked like it was going to turn positive, but it stayed negative, and ASP (average selling price) dropped. Cook: We had a 1.6 million unit swing in channel inventory year-over-year. On top of that on the ASP front, a year ago we launched the 12.9-inch iPad Pro. Launch plus channel fill of that high-priced model bolstered the ASP in that quarter. In addition, we did undercall the demand for iPad this quarter and that compounded a supply issue with one of our suppliers. If I sort of zoom out of 90-day clock, we've got some exciting things coming on iPad and I'm optimistic about where things are headed. Customer satisfaction is through the roof. iPad Pro at 99%. So I see a lot of good things and hope for better results. We are still currently in a shortage issue, and I'm not projecting to get totally out of it this quarter, so it will dampen things this quarter. But I'm very bullish. 2:52 pm: Follow-up: Tim, you've said before you've always hated litigation and prefer to settle. Yet you've sued Qualcomm. Why, and what outcomes do you see? Cook: I feel the same way I did then. I view litigation as a last resort. You should take from our filing that we didn't see another way forward. They were insisting on charging royalties on technologies they had nothing to do with. So the more we innovated, the more money Qualcomm would collect for no reason. It's somewhat like buying a sofa and being charged differently depending on what house it goes into. We don't believe it will pass muster in the courts. Additionally, as part of their steps to uphold that model, they withheld $1 billion payments they owed us. We had no choice. As for where it goes, we'll see. I don't like litigation. If there's another way, that would be great, but right now I don't see it. I think it'll take some time, and at the end common sense will prevail and the courts will see it for what it is. 2:49 pm: Q from Toni Sacconaghi, Bernstein: Broader perspective on how investors should think about upgrade rates. Feels like they peaked with iPhone 6 and replacement cycles have been lengthening. Are their opportunities for upgrade rate to improve? Maestri: Installed base is growing well, and that's good. Geographically, we see different developments. Very good unit growth in many markets around the world. In U.S., annual upgrade programs are becoming popular, which is a positive for us. The point I need to make on upgrade rate is the strong dollar doesn't help us. We could sell significantly more and upgrade faster outside of U.S. where we've been forced to increase prices by 20, 30, 40 percent. That doesn't help us. When we look at new generation phones, the percentage of people who are on the latest phones is similar to last year. iPhone 6 was certainly special with pent-up demand for the larger screens. The more we can innovate, that will play a role in the upgrade rate. 2:44 pm: Follow-up: With comps getting easier, are you expecting to return to growth in China this year? Curious about iPhone units in mainland China if you back out iPad and MacBook, aa well as shifting mix to iPhone 7 Plus. Cook: If you look at 7 Plus, it was the most popular Plus model we've ever had. And in terms of how we're going to do, we don't provide guidance at segment level, but in Q2 I wouldn't expect dramatic difference from year-over-year in Q1. 2:43 pm: Q from Simona Jankowski, Goldman Sachs: iPhone upside question about various markets. Cook: We didn't predict demand very well on iPhone 7 Plus. If you look at absolute number of upgraders, highest we've ever seen. Same for switchers. On upgrade rate, it's similar to last year, but the big asterisk is that in a quarter with supply constraint, it's difficult to draw too many conclusions. 2:41 pm: Follow-up: Tim, haven't heard much about India. Cook: All-time record revenue results. India's demonetization move hasn't worked its way through yet, but we feel great about that market. We plan to invest significantly there. 2:40 pm: Q from Brian White, Drexel: Gross margin analysis. Maestri: We were at high end of margin guidance range, due to revenue being ahead of expectations, so we got a bit more leverage. We feel very good about the margins, keeping in mind currency. 2:39 pm: Follow-up: From currency perspective, with emerging markets and currency issues and thus some increased prices, how are things working out? Maestri: Dollar is significantly strengthening, causing challenges at revenue and margin levels. In emerging markets, the level of interest is phenomenal. Middle class is growing, but a strong dollar doesn't help us. So we need to be careful in pricing decisions in finding balance among units, revenue, and margin. 2:37 pm: Q from Shannon Cross, Cross Research: Can you talk a bit more about Services? What gets you to doubling it over four years? As you grow that, how should we expect margins to be impacted? Maestri: Within Services, we have a number of categories. App Store is driving significant growth. It's truly a global platform, so not only in developed markets, but also seeing great growth in emerging markets. As we look at the number of people that transact growing, and the amount spent per account growing as well, App Store will be a significant driver. On the music front, we're the market leader. Combining download with streaming, we've come back to growth over last three quarters and we can continue to grow. iCloud storage business is growing very quickly. AppleCare growing very well. A lot of it comes from installed base continuing to grow well, so we have a tailwind there. We're also opening several new markets with new payment types being accepted. As for the margin profile, in aggregate, Services tends to have margins above company average, so they help. Within Services, we have very different margin profiles. 2:33 pm: Follow-up: In China, what is the demand you're seeing on the ground there and what do you expect for this year? Cook: Revenue is down 8% in Greater China, but 4% of that is currency related. In China itself, revenue was flat, or up 6% in constant currency. iPhone proving very popular. 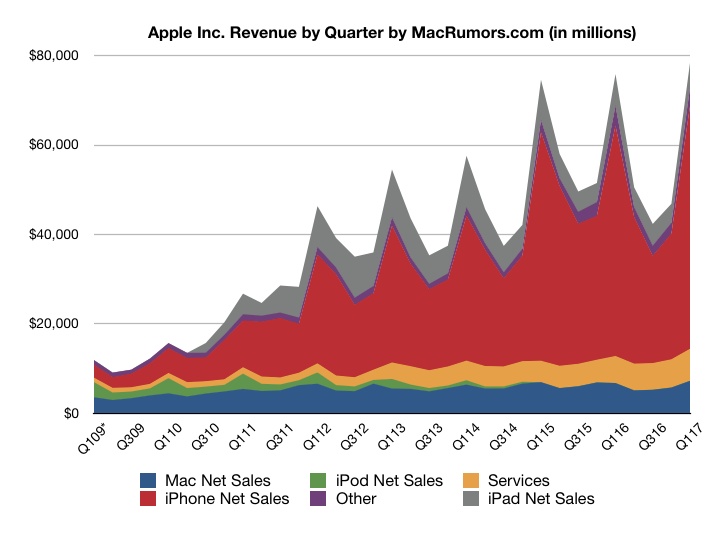 Mac and iPad revenue also very strong. 50% of iPhone sales there were to switchers and first-time buyers. That said, challenges include currency, which has devalued 6% year over year, and Hong Kong remains a difficult market. I'm encouraged with improvements, but we're not without challenges there. 2:30 pm: Q from Amit Daryanani, RBC: Services growth...how much is coming from installed base and how much is new customers? Maestri: The number of people who are transacting is increasing, as is the revenue per customer, so it's a combination. People spend more and more over time, and that's why we're excited about the future of it. That's why we have a goal to double it over the next four years. 2:28 pm: Huberty: Tim, you may get access to $200+ billion in overseas cash. Your views on larger mergers/acquisitions or other areas like original content, etc. Cook: I am optimistic given what I'm hearing that there would be some tax reform this year, and it does seem like some people in both parties would favor repatriation as part of that. What we would do with that, let's wait and see. As I've said before, we're always looking at acquisitions. We do 15-20 per year of all sizes. In terms of original content, we've put our toe in the water. That will be rolling out and we're learning from that. The way we participate in the changes in the media industry includes the Apple TV, which we're happy with. Gives us a platform to build off of. We're also involved as a third-party platform for selling content, and then our toe in the water on original content. 2:25 pm: Analyst Q&A beginning. First question from Katy Huberty, Morgan Stanley. Why has gross margin prediction widened? Maestri: If you look back, it isn't that wide. But in this currency market, it is prudent to keep the range fairly wide. We expect foreign exchange to be a headwind for us this quarter. 2:22 pm: $201 billion of $250 billion capital return program has been completed. We will provide an update on this program in the spring. 2:22 pm: $246.1 billion in cash and marketable securities, up $8.2 billion. Returned almost $15 billion to investors through dividends and buybacks. 2:21 pm: Retail stores saw strong double digit growth in revenue and visitors. Plan to open first store in Singapore and second in Dubai soon. Continue to renovate stores. 2:19 pm: iPad has 85% share of U.S. tablet market priced above $200. High consumer satisfaction and customer purchase intention remains high. 2:19 pm: 5.4 million Macs sold with highest ever quarterly revenue. Double digit growth in many markets. iPad sold 13.1 million units, ahead of expectations. Growth in China and India where we expanded distribution. Reduced iPad channel inventory by 700,000, compared to 900,000 increase last year. 2:17 pm: All-time revenue record for Services. 14th week more than offset by last year's patent judgment that was recorded in Services. 2:16 pm: Added only 1.2 million units of iPhone channel inventory across quarter, less than 3.2 million in year-ago. 2:15 pm: Double digit iPhone growth in U.S., Canada, Western Europe, Australia, Japan, and even more in some other markets. 2:15 pm: We had the benefit of a 14th week, but this was offset by several factors including less channel fill than last year and a one-time $548 million patent judgment receipt last year. 2:13 pm: Maestri: Revenue was $78.4 billion, a new quarterly record. Set new records for iPhone, Mac, Services, and Apple Watch. Strong performance in both established and emerging markets, despite very challenging foreign exchange environment. 2:12 pm: Thank you to developers, business partners, and employees for their contributions and commitment. And thank you to our customers. 2:12 pm: Enterprise business is going well. Cisco partnership for iOS helping their workforce be more productive. IBM's mobile initiative is driving new productivity apps for specialized business uses. And SAP is rolling out tools to allow their customers to leverage their platforms. 2:10 pm: Every major car manufacturer is committed to CarPlay, with over a million people already using it. Industry leader in integrating home automation into a mobile OS with HomeKit. Number of accessories continuing to grow rapidly, and committed to home security with door locks, garage door openers, alarm systems, and more. 2:08 pm: Strong performance for Mac, particularly MacBook Pro with Touch Bar. Apple Watch also setting records even though we couldn't make enough. Thrilled with response to AirPods. Behind AirPods, Apple Watch, and Beats, we now have a rich lineup of wearable products. Their design, elegance, and ease of use make us excited about the growth potential. 2:07 pm: Services on the verge of being a Fortune 100 business. Our goal is to double it within the next four years. 2:06 pm: Best quarter ever for Services. Set App Store records in the quarter, with December the single best month ever. Developers have earned over $60 billion, including over $20 billion in 2016. Music, Apple Pay also setting records. Apple Pay transaction volume up over 500% year over year. Apple Pay on the web seeing great results, with nearly two million small businesses accepting it. Comcast will start accepting it later this month. 2:04 pm: Very strong iPhone demand. iPhone 7 was highest, with iPhone 7 Plus in particular demand. Finally came into supply-demand balance in January. 2:03 pm: Cook: Good afternoon everyone. Very happy to share outstanding results, where we generated highest revenue in history. Record revenue in iPhone, Watch, Services, and Mac, as well as four out of five geographic segments. Earnings per share was also a record. 2:02 pm: Conference call is underway. Cook and Maestri will give opening statements, followed by Q&A with analysts. 2:00 pm: Conference call should be starting shortly. 1:44 pm: Apple's stock is currently up about 2.7% in after hours trading on the strong results. Make no mistake. Tim Cook is a skinnier version of Ballmer. Total lack of vision. Total lack of the importance of ecosystem (monitors, routers…). Sacrificing user experience for margins (5400rpm spinners…). TIM COOK MUST GO!! HE IS THE WORST! HE IS DESTROYING... wait what? So can we give Tim a break for a minute or two before flipping about macs? Have to say that's an obscene amount of money, and nothing given back to the customer. Also shows how much of a one trick pony they still are. Would be nice if they reduced the iPhone and iPad costs in the UK, considering the pounds gone back up but noooo. Wow, thats a lot of the business depending on a single product. As one of those customers I don't feel that nothing has been given back to me. In exchange for my funds I have received iPhone, iPad, MacBook Pro, and Apple Watch this past year. It's an exchange of money for goods and services and I feel I've received value for the deal. 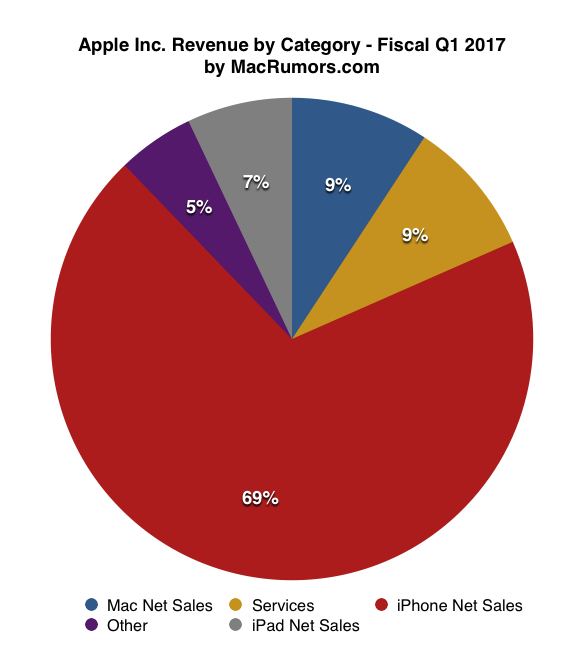 9% is Mac share of revenue. If anyone is unclear about why there is little love for the Mac, there's your answer. P.S. figure out what percentage of the 9% is the Mac Pro. So out of the 10 "experts" from this article: https://www.macrumors.com/2017/01/31/apple-expected-to-return-to-growth-with-biggest-earnings-ever-today/ only one person guessed more. As others have said, can we give Tim a break? He might not be as good as Jobs but he's doing a fine damn job. At running a profitable company? Sure. At providing a wonderful user experience. No. And who's fault is that if not apples? They intentionally let stagnate whole lineup for years. This just shows that people aren't stupid and not going to buy anything. If Apple actually cared we would see at least yearly and substantial updates to whole lineup. i guess that 'boring' iphone 7 wasn't so boring after all. i can't imagine what sales will be like in a year with iphone 8. Services is almost as big as Mac sales (which were also up). Looks like that Macbook pro that everyone was complaining about sold very well. only thing that was down was the iPad.